The No.2 ranked UCLA Bruins (3-0) take on the Maryland Terrapins (3-0) in a semifinal game of the CBE Classic in Kansas City, Missouri tonight. It will be the inaugural game of the newly built Sprint Center. UCLA is coming off three blow-out home victories against over-matched opponents including a win over CS San Bernardino last Tuesday to advance to tonight's game. This will be the Bruin's first contest on the road this seaason, albeit in a neutral site match-up. The Bruins will suit up just eight scholarship players for the tournament. Darren Collison (sprained left MCL), Michael Roll (ruptured plantar fascia), and James Keefe (left shoulder surgery) will be watching from the sidelines. All three players are expected back in action during December. Freshman Kevin Love leads the Bruins in scoring (20.7) and rebounding (10.3) while hitting on 65.6% of his shots. He will get a better measure of his play at the collegiate level when he matches up against the tough front line of Maryland. Despite winning all their games so far this season, the Terrapins have had problems in the early going. They struggled against Hampton before beating them 70-64, and then had to go into overtime to defeat Northeastern 74-72. Maryland has actually outplayed their early opponents in most every facet of the game; however, they have struggled with turnovers. The Terrapins are averaging 21.3 turnovers per game. Point guard Greivas Vasquez has been the main culprit turning the ball over 15 times in just three contests, while forward/center Bambale Osby has exhibited stone hands inside turning the ball over 11 times. Aside from the turnovers the Terrapins are shooting 44.9% from the field while holding opponents to just 32.7% field goal shooting. Maryland is also controlling the boards with their front line grabbing 43.7 rebounds versus 32.7 by opponents. Maryland is a pressing team that will apply fullcourt pressure after every made basket including free throws. They have an experienced front line and athletic perimeter players who can cause problems on both ends of the court. James Gist (6'8, 233, Sr) is the Terrapins leading scorer (21.5) and rebounder (8.5), a tough low post scorer and offensive rebounder. The Bruins need to keep him in check and off the boards. He scored a career-high 27 points in his last game. UCLA's Alfred Aboya will get the initial assignment Gist. Aboya has suffered from early foul trouble in past games, and with the Bruins shorthanded and facing a quality opponent they can not afford to lose Aboya to foul trouble. Senior forward/center Bambale Osby (6'8, 250, Sr) recorded his first career double-double with 16 points and 13 rebounds in his last game. He also had six blocked shots. In three games he is averaging 12.3 points and 8.3 rebounds although he's had problems holding onto the ball inside averaging 3.7 turnovers a game. Love will get the match-up against Osby although Osby will probably get plenty of help from his swarming teammates on the defensive end. While Love is just a freshman, he has certainly not played like one in his first three games. At the small forward spot for the Terrapins is Landon Milbourne (6'7, 205, So) who is averaging 6.5 points and 5.5 rebounds a game. Milbourne took over the starting spot when junior Dave Neal dislocated his shoulder in an earlier game. Luc Richard Mbah a Moute will be match-up against Milbourne. Mbah a Moute is averaging 6.7 points and only 2.7 rebounds a contest. Spending most of his time on the wing this year has reduced his rebounding chances. Over the last two seasons, Mbah a Moute was the team's leading rebounder averaging 7.8 a game. At shooting guard the Terrapins start Eric Hayes (6'3, 175, So). He is averaging 11.0 points and 4.3 assists while shooting 45% from the field. A good long range shooter who is averaging 45.5% from three-point range. UCLA's Josh Shipp will try to keep Hayes in check. Shipp has shown improvements in his defensive game so far this season and has been deadly from outside averaging 15.0 points a game on 58.6% shooting and 44.4% from beyond the arc. The Terrapin's point guard Greivis Vasquez (6'5, 195, So) may be the wild card of this game. He has struggled with his handles and his shooting touch in the early going, however, if he steadies himself and starts to play like someone who plays on the Venezuelan national team, then the Terrapins may have a chance in this game. Greivis is averging 16.7 points and 6.7 assists but has also committed 5.0 turnovers a game. He is also shooting just 41% from the field. Russell Westbrook will get his first real test against a quality point-guard. He will try to hound Vasquez on the defensive end while continuing his improvement on the offensive end. After struggling with turnovers himself, Westbrook committed just one in the Bruin's last game. UCLA has been playing good ball despite struggling early with injuries, and are favored to win this game. On the other hand, Maryland has had problems in their first three game and perhaps has played down to the level of their opponent. Against UCLA, Maryland should have no trouble getting themselves up for the game. With this contest being on a neutral site, depending on which Maryland team shows up tonight, the game could be closer than some might expect. The winner of this semifinal game takes on the winner of the other semifinal battle between Missouri and Michigan State. BBR Notes: Kareem Abdul-Jabbar was inducted into the College Basketball Hall of Fame on Sunday. In addition, former Maryland head coach Lefty Driesell was also one of the eight honorees inducted into the Hall of Fame. FYI, Milbourne did not take over the starting role due to Neal's injury. Milbourne sat out the first game due to suspension for playing in an offseason tournament. Neal was injured in the 2nd game, which Milbourne started. Your closing comment is spot on: hopefully the "good" Maryland team shows up tonight and gives your Bruins all they can handle. Another excellent write-up. Thanks BBR. Can't wait to see a game against a real division 1 team. 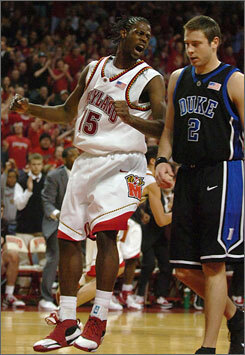 The Terps have a great basketball tradition. This is a perfect game to see how Mata-Real does. He may very well be our wild card factor as I am thoroughly impressed with his defense and tenacity around the basket. When an opponent has a strong front line, it is too much to expect Love to handle it all. Mata-Real may play a "huge" roll this year (finger's crossed)! Wow, what a great preview. I'm a Terps fan living in MD. After being disappointed with the Baltimore Sun's preview... and not finding one on ESPN.com I searched google. It was nice to read such a thorough, non-biased write-up.